These gluten-free bagels are so much like the real thing, you just might think you are dreaming. The pumpkin and cranberry flavor is just a bonus on top of the perfect bagel density and chewiness! I designed these to be 100% AIP compliant, but I’d be selling them short if I didn’t also try to pitch them as a straight up gluten-free bagel because they are way better than any of the store-bought bagel abominations cluttering up the grocery store shelves. They also happen to be vegan and nut-free, so you should be able to share them with virtually anyone! First of all, I strongly suggest you weigh your flours. I’ve provided the volume measurements as well, but the only way I can guarantee you are matching the proportions I used in developing this recipe is by matching the weights. Second, I can’t promise that other flour brands will yield the same results no matter how carefully you weigh them out. I only use Otto’s Cassava Flour in my recipes, this one included. I don’t think it is quite as important to match the brands of the other ingredients, but just for your information I can tell you that I used Anthony’s Organic Tigernut Flour and Bob’s Red Mill Arrowroot Flour/Starch. 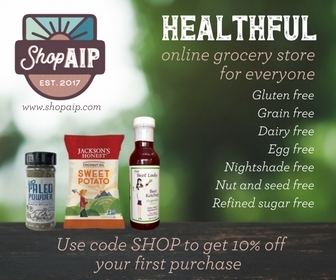 As always, my favorite source for AIP compliant baking ingredients is ShopAIP! You’ll have the best results if you get your dough very well mixed and the best way I know how to do that is to plop the dough out on your kitchen counter and knead it with your hands. Obviously, since this bagel dough is gluten-free, you aren’t kneading it for the traditional reason of helping form extra strong gluten strands, but it does seem necessary for making a good consistent dough. Plus, I love the feeling of getting my hands on warm yeasty dough again! You also might wonder if the yeast is necessary, especially since we aren’t even allowing time for “proofing” the dough. It is not – though I like the flavor it adds. Baking yeast is AIP-compliant, but I do know that some people have other reasons to avoid it. If you are one of those people, simply leave it out. The yeast I prefer to use is Red Star Active Dry Yeast, in the individual packets. It is one of the few yeast options available that has no added preservatives or stabilizers. If you’ve never made homemade bagels before you might struggle with the shaping portion of the directions. There are two different “traditional” ways of doing it, both of which have their adherents and would work for this recipe. One way is to form a snake shape, loop it around your hand, and roll it on the counter to seal it together. The other way is to shape the dough into a rough bagel shape, stretch it out, and poke a hole in it with your finger. I personally prefer the “poke” method to the “snake” method… but you do whatever works for you! You might think you are dreaming when you bite into these AIP bagels! The texture and density is spot-on, the pumpkin and cranberry flavor is just a seasonal bonus. The baking process for bagels includes two steps: boiling and baking, so set up for that first. Fill a large pot with enough water that you will be able to place 3 bagels in it at a time and give them enough room to move around and not touch each other. Preheat your oven to 450° F and line a baking sheet with either parchment paper or a silicone baking mat. Put warm water in a pourable measuring cup and add maple syrup and yeast. Mix and set aside for a few minutes while you weigh and mix your flours. Using a baking scale, measure out the tigernut, cassava, and arrowroot flours and place in a mixing bowl. Add salt and whisk all to evenly distribute. Add pumpkin puree to flour mixture and then add about ¾ of the water and yeast mixture. Combine with a spoon and note how dry or moist the dough is becoming. Add just enough of the remaining water to create a dough that is able to be mixed together and hold its shape and not overly wet and hard to manage. Place dough on a clean countertop and use your hands to knead a few times, ensuring that the flours and all ingredients are evenly distributed and a good dough has formed. Divide the dough into 5 equal sized portions and shape into bagels. Carefully place 3 bagels, one at a time, into the boiling water. Set a timer right away for 4 minutes. They will sink to the bottom and may stick there, so after about a minute of boiling use a long handled slotted spoon or a skimmer like this one to gently dislodge them from the bottom and let them float up to the top. After 4 minutes of boiling, remove each bagel with the slotted spoon or skimmer and place on the prepared baking sheet. Repeat with the remaining 2 bagels. Remove from oven and let cool for at least 30 minutes, then slice and eat. These taste best on the day they are made but can be frozen if you wish to keep them longer. I really couldn’t say. The pumpkin is a source of moisture and helps bind it together, so I don’t know how it would be to leave it out. The pumpkin flavor is not very strong and doesn’t make it sweet, so you could always leave it in and just live with the fact that it is kind of orange. Pumpkin isn’t super sweet so I’d leave it in! Add some garlic and herbs. Yum! I can’t wait to try these. Do you have any recommendation on what would be a good cassava substitute? Unfortunately I cannot have it. There is nothing quite like cassava flour and it is key to creating the bagel texture. Unfortunately, I don’t have a suggestion for you – someone needs to work on developing a bagel recipe that doesn’t use it, I guess! I have made it without the yeast! It works just fine… slightly denser texture, but that is generally OK in a bagel. The yeast is mostly for flavor. These look and sound really, really good so I hope to try them this weekend. I’d also like to make a savory version though. Would I need to swap out the maple syrup for another non-sweet liquid? Or does the syrup add any noticeable sweetness? No, if you are going to use the yeast you want to include the maple syrup as it feeds the yeast. The sweetness it adds is almost imperceptible. I just made these and they are amazing!! Thank you for this recipe. I doubled the recipe and my 5 year old and I have already demolished one of the bagels while taste testing for breakfast tomorrow morning. I am wondering if I could store them in the fridge and eat them throughout the week and still keep the same texture? I know you said they were best the same day and you could freeze them. Any suggestions on the best reheat method after freezing? Sorry I’m seeing this two days after you posted it! I bet you’ve already either eaten them all or decided what to do by now… For next time, I suggest slicing them all ahead of time and then freezing them. Then reheat from frozen in a toaster oven or under the broiler in your regular oven. This looks so good! Any ideas for someone who reacts to all sugar including honey and maple syrup? I can only sweeten my food with fruit. Do you think using a tablespoon of applesauce would work instead of the syrup? Thank you for all you do to help people with health challenges. I have made a number of your recipes and they are all fantastic! They help me to feel somewhat “normal”. Thank you so much for the kind comment! I’m so glad I’m helping you in some way. Yes, I think putting in a tablespoon of applesauce would work – it is only there to provide some food for the yeast. Great idea! Really awesome recipe, Jaime ! I just love bagels , thanks! These look amazing, can’t wait to try them. I was wondering if sweet potatoes or butternut squash could be used instead of the pumpkin? I have not tried… seems to me like it would probably work. If you try it, please let me know! Hi There! This is a recipe I am going to try! What do you put on the bagel? I cant have a bagel without some kind of cream cheese…do you have an idea for that? Thanks for the recipe.